Faema is on an international tour, and will be there to welcome you! Don't miss all the innovations on show at the Seoul fair - a revamped stand in an Art&Caffeine mood will be hosting interesting and exciting activities! 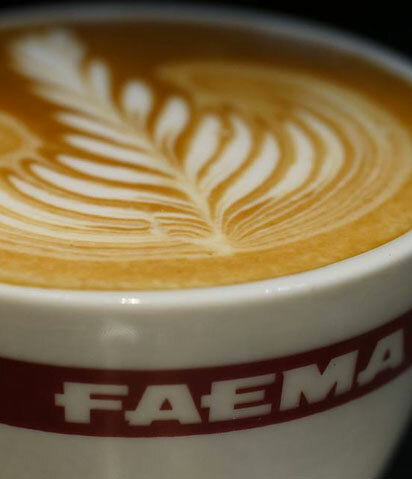 Faema plays a leading role in one of the sector's most important annual fairs, as its new stand acts as a showcase for the FAEMA E61 and FAEMA E71, new icons for baristas and coffee specialists. It will also be possible to take part in the finals of the WBC (World Barista Championship), the most important international competition held by WCE (World Coffee Events). But that's not all - Matteo Beluffi, Italian Latte Art champion, will be showing off his skills at the stand by creating complex, spectacular latte art designs! EXPRESS YOUR ART illustrates the legendary brand and product, conjuring up atmospheres replete with passon, art, tradition, quality and coffee culture, stepping into the world of trhe barman. the FAEMA coffee machines is the tool that allows you to set your passion for coffee in motion and enhance your artistic skills.